Courtyard by Marriott Tokyo Ginza Hotel. This 4 star property is perfectly located for exploring Tokyo. 10 minute walk to the Tsukiji Market and 10 minutes to the Ginza subway station. Lots of convenience stores in the area—and the hotel itself is both comfortable and friendly. These are a few of my favourite things… I’ve come to look forward to spending quality time in some of my favourite places in Tokyo before heading out of the city to explore further. There are many restaurants, hotels, shops and attractions that I love to visit…so here are just a few. CULINARY BLISS Bliss is defined in Wikipedia as “an emotional state that is characterized by perfect happiness (feelings of enjoyment, pleasure, and satisfaction). Culinary Bliss refers to a state of euphoria (intense satisfaction) based on food and drink. It refers to that dish placed before you where the appearance is so pleasing, the aroma so tantalizing that the first taste results in laying down your chopsticks and just relishing the intense, creative, pleasurable sensations that the food unleashes, as the flavours wend their way through your senses, creating that explosive taste-bud ‘wow’. Most people travel in the pursuit of pleasure, whether it’s a beach vacation, a journey of adventure or something inbetween. But the one aspect that links them together is the food in which the destination specializes. Now I did meet a travel educator once who shocked me by stating that he would never visit a country where he could not order western food for all his meals. This was not due to any food sensitivities. To him it was a matter of principle that if he was spending money to visit a country, there had to be some compromise for him to eat his breakfast of bacon and eggs. But this person seems to be the anomaly, as most people enjoy tasting, trying, sampling and indulging all their senses in the pursuit of good food. 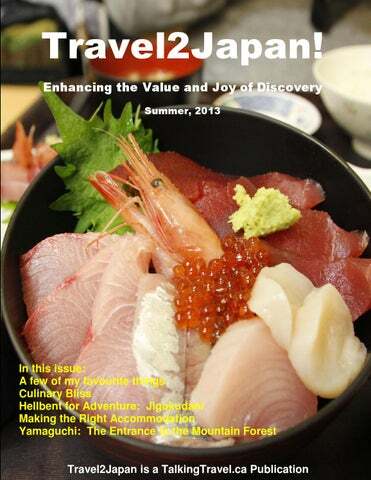 Japan is so ideally suited to these travellers, whether your preference is fish, meat or vegetarian. And by the way, the most popular foods-sushi and sashimi taste so different in Japan from what most people taste in their home town in the U.S or Canada. We are talking about melt-in-your mouth, fresh seafood and real, honest-to- goodness freshly prepared sushi rice: the creation and pride of the resident passionate chef. Mything my Meals. A common Myth-perception about visiting Japan relates to the cost of meals. There are in fact sushi restaurants where the set menu will cost 30,000 Yen (roughly $310.00 US). But you can find upscale speciality restaurants in every city in the world. In Japan you can easily eat according to your budget, and the range of eating establishments stretches from food concessions in the Tsukiji fish market, to fresh ready-to-eat meals available at convenience stores, to chain restaurants, and food courts in both shopping malls and department stores. You can eat lunch for as little as $5.00, with an average price being about $15.00 per person at a food court. And the great thing about Japan is that almost without exception, food services are clean and the food is freshly prepared. Culinary Rules of Engagement 7 Eating tips when in Japan Sometimes travelers get caught up in fascinating rumours about a destination, so much so that they hesitate to even travel for fear that they’ll offend others, feel embarrassed or question their ability to learn and laugh off any ‘mistakes’. Before I list some of the key tips to finding comfort in a Japanese restaurant, travelers can be assured of two things. 1) Chopsticks. All restaurants in Japan use chopsticks. Some will have forks for those who are chopstickchallenged. There is a tourist rumour that you need to Contemplating culinary perfection in Kotohira, Shikoku bring your own chopsticks from home in case you end up in a restaurant that uses washable chopsticks that could result in health concerns. This is a myth! First of all, many restaurants use single-use (disposable) chopsticks. Those that don’t are usually clean and sanitary. I know of one chopstick-challenged traveler who brings a compact fork/spoon contraption that she bought at an outdoor store just in case she finds herself in a situation where only chopsticks are available. Her attitude is no fuss—no bother--she just uses her own utensil, folds it up in a plastic bag and washes it for later use. 2) Visual Dishes. Many restaurants feature plastic displays of the main dishes. Therefore when you see something you like, you can point to the dish. But even when there is no display, many menus include pictures of the dishes, so you can see what best whets your appetite. And remember that many guide books (and websites) have the names of dishes in both English and Japanese. All in all, I have found that dining in Japan—whether upscale or more popular, is a very pleasant and friendly experience. Many Japanese know some English (although they may be reluctant to use it) but this means that there is a fair chance your requests will be understood. And one more note… I have been to many restaurants where a friendly Japanese patron who understood and spoke English, offered to assist in ordering food. This in turn led to many pleasant –and educational— conversations about Japanese cuisine. So you win either way! 3) Eat the Leaf! In North America we are used to using leaves in our cooking to add flavour (the Bay leaf is the most popular). You set it aside and eat the food on which it lies. Not so in Japan. The tasty leaf you will find on your chirashi or in other dishes is the perillo leaf (Shiso, in Japanese). Curl it around the rice in your dish, pop it in your mouth and savour the flavour. 4. Don’t drown your food in soy sauce. In North America we have a tendency to overuse salt in our foods. Therefore it’s not uncommon to find patrons in Japanese restaurants literally bathing (or drowning) the delicate flavour of sashimi or sushi in a bowl of soy sauce. While you can enjoy the same experience in Japan, you will find that in more upscale Japanese restaurants, the chef is very hands-on. He makes the sushi by hand, places it on your plate by hand, you eat the sushi by picking it up in your hand (not chopsticks) and…the chef will advise which pieces of sushi are best eaten with soy sauce—which are best eaten with ground ginger and which should be savoured with no additives. Even if the chef advises that soy sauce should be used, you carefully ‘kiss’ the sushi or sashimi with the soy sauce to apply a thin layer and complement the flavour, resulting in what many refer to as “Umami” (Pleasant savoury taste). 5. Don’t stick your chopsticks into your rice like two trees. This is a major dining faux pas (or shitsugen) in Japan and other Asian countries where chopsticks are stuck into a dish of rice at funerals. In between bites or at the end of the meal, you can lay your chopsticks across the bowl or plate, or if chopstick rests are provided (hashioki) then lay the tips of the chopsticks on the holders. If you are using disposable chopsticks, simply lay them on top of the paper wrapping from which they came. 6) Drink your miso soup from the bowl or cup. The ingredients in your miso soup can be plucked out using chopsticks but then you should not start looking around for the spoon. Just pick up the bowl or cup and drink the liquid broth. 7) Slurp! It’s absolutely ok to slurp your soup, slurp your noodles and anything else you wish. Everyone around you will be doing it to inhale in all the flavours at the same time. Put aside your parents’ warning ‘not to slurp’ your food. In Japan is perfectly acceptable. A sign for the Butatama Ramen Restaurant…savour the flavour and get ready to slurp! Okonomiyaki—ready for snacking at one of the Asakusa Temple festivals. You can visit Okonomiyaki Street in Tokyo, and make your own ‘pancake” from a batter made with seafood or meat and vegetables. It’s very yummy (oishi). Above, sampling sake from Ehime province in Matsuyama City. Below, Snake Awamori (Habu) is very potent alcohol with the added bite of a pit viper in the bottle Only available in Okinawa. Beer still ranks as the most popular alcoholic beverage followed by sake and then shochu. To toast before you drink, say “Kanpai”, literally ‘Dry the Glass’ or ‘Bottoms Up’. where a “Monkey Park” sign points to a path. You walk though a forested area for about 30 minutes before arriving in Jigokudani. We stayed at the Korakukan Ryokan, a traditional guest house located very close to the entrance to Monkey Park. The rooms have the traditional tatami mats on the floor and your bed consists of a thick duvet and blankets laid out on the floor, like your own personal cocoon. After a day of touring you can soak in either the indoor or outdoor hot spring (onsen) and then, wearing your slippers and Yukata (kimono), both supplied by the guest house, you come down to a delicious multi-course dinner of miso soup, pickled vegetables, fish, tofu and rice. As some of the Japanese guests spoke English, we had a great chat with them and shared small bottles of sake during the dinner. The total cost for our stay, including dinner and breakfast the next morning was about $90.00 per person. Jigokudani or Hellâ&#x20AC;&#x2122;s Valley, is named after the many hot springs and boiling water that oozes and steams out of the crevices in the ground. The main attraction is the snow monkeys (Japanese Macaques) who, during the winter months, come down from the mountains where they have been foraging for food, and immerse themselves in the hot springs inside the park. You can see monkeys of all ages and sizes enjoying the hot steaming waters; sitting, playing, and seemingly meditating while tolerating the click of cameras from the tourists. All this takes place under the watchful eye of a park warden. Fortunately during out stay, there were only about 10 other tourists and after the mandatory close-up shots of peaceful monkey faces, most of the visitors put down the cameras and just shared in the tranquility, uniqueness and privilege of eye-witnessing this famous nature spectacle. Once you head back for the evening (depending on the season, the park closes at 3:00 or 4:00 pm) and you head toward the outdoor hot bath at the Ryokan, it is not unusual to find monkeys either scampering out of the bath when they see you approaching or, in some cases, the monkeys stay put and you can share your soaking experience with a simian relative! We checked out of the Ryokan the next morning after breakfast, walked the 30 minute path and caught the bus and train back to Nagano. All in all, this was an amazing experience: One of those times where you say to yourself â&#x20AC;&#x153;There are 6 billion people in the world, and here I am with 10 others, sharing an incredible travel-experience-bondâ&#x20AC;?. If you are hell-bent on a having a great adventure, you might consider including Jigokudani on your next trip to Japan. Location is a major factor. The Courtyard Tokyo Ginza is a 10 minute walk to the hustle, bustle, traffic and amazing food at the Tsukiji fish market. Terms of Reference: Location: Some people prefer to stay in the heart of a city for the excitement, the energy, the transportation connections and the nightlife. Others may prefer to stay some distance away for the peace and quiet or for a specific cultural experience, while still others might choose a hotel right out of town for the natural setting and solitude. Lifestyle refers to your own needs. This may relate to the star-rating of the hotel and your Location- Decor- Attitude: preference for 1 star or 5 stars. Lifestyle can The Courtyard by Marriott Tokyo Ginza Hotel Ginza has it all also be affected by everything from the colour scheme used in the rooms and hallways, to the amenities in the rooms or how ‘green’ the hotel is in terms of their environmental footprint. In Japan, lifestyle can relate to the type of room you are looking for: Western or Japanese. Western rooms mirror those you will find anywhere in the world—one or two beds, a bathroom, a television, a desk etc. Japanese rooms –also known as tatami rooms, are a different experience. Tatami: These straw mats cover the floor of the room and are used for all activities including sleeping. The furniture in a tatami room may be knee-high or shorter, with the idea that you sit cross legged, with your legs in front of you or side saddle. The chairs --more like chair-backs-- offer back support as you sit at the tea table. Tatami rooms usually have a television, a storage closet where you’ll find the futon, blankets and pillows that the house-keeping staff will lay out on the floor for you at night time. Rooms will have a washroom, equipped with a Japanese bathtub—which is usually very deep for soaking. Other lifestyle factors may relate to the type of hotel: a high story hotel with hundreds of rooms, a small hotel for a more intimate stay, a Ryokan (a traditional bed and breakfast), a business hotel (usually 2-3 stars) for convenience and cost, and of course ‘capsule’ hotels which the author has scrupulously avoided to date. Attitude: The attitude of the hotel, as a whole, is often what inspires people to return. Do you receive an enthusiastic greeting when you arrive or robot-like demand for a credit card? Is the decor of the hotel and your room to your liking or does it remind you of something that your grandparents would love—or at the opposite end of the spectrum, something that would be better placed in Las Vegas, rather than Tokyo? Does the staff make a concerted effort to smile, be friendly and act helpful or do they try to look busy whenever you approach the front desk or the concierge. And lastly, does the hotel leave a good impression on you when you check out—are they friendly and wish you a good trip onward, or is the check-out an impersonal business transaction from an unsmiling clerk who just wants you to pay the bill and leave? All these factors come into play at any hotel, anywhere in the world. Here are some hotels that I recommend. 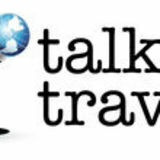 Updates will be added in future issues of Travel2Japan. The Travel2Japan Hotel Advisory Tokyo-Courtyard by Marriott, Ginza—this is one of my favourites. Great location—only a 10 minute walk to the Tsukiji fish market, 10 minutes to the Ginza Metro station, 10 minutes to the Kabuki Theatre and shopping. The colours used in the hotel are comfortably warm—both in the lobby, corridors and rooms. Free internet for guests, exercise room. Friendly, helpful staff. Convenience stores in the area for picking up water or snacks. I really enjoy staying here. Tokyo-Hyatt Regency, Shinjuku—easy access from the Nishi-Shinjuku Metro station. Great views of Mt. Fuji if you’re facing the right direction and are on a high floor. 15-20 minute walk to the Shinjuku subway as well as the main shopping area of stores and restaurants galore. Good décor. Friendly and helpful staff. Convenience store and some shops in the basement. Tokyo-Tokyo Hilton, Shinjuku—literally across the road from the Hyatt and so very similar features and amenities exist in terms of very easy Metro access and close to the Shinjuku shopping and restaurant areas. Convenience store outside, around the corner. Helpful staff. Popular hotel for weddings and conferences. Tokyo-Niwa Hotel—accessible by train/Metro, this hotel offers a quiet alternative from the downtown hustle and bustle. Beautiful property built around a garden (niwa) with very pleasing décor, comfortable rooms, beautiful tea pots in each room, free internet and friendly staff. Takayama (Chubu) Rickshaw Inn—stayed here on three occasions. 10 minute walk from the train station—5 minutes to restaurants or the morning markets. Very friendly place to stay. Yamaguchi prefecture is tucked away in the north-east corner of Honshu Island, in the Chugoku region of Japan. It’s an area in which one can absolutely fascinate over the small towns, history, nature and ambiance, before continuing eastward toward Kyushu to explore its own bounties of pottery, fugu snacks and the fiery attractions of volcanoes, mud baths and shochu (Kyushu’s home grown alcoholic beverage of choice). The historical translation of “Yamaguchi” is the “entrance to the mountain forest’, but literally the name means Mountain (Yama) Mouth (Guchi) and refers to the Chugoku mountains and the ancient volcanoes in the region. For travellers looking to go beyond the standard tour itineraries and discover Japan from a different perspective, Yamaguchi is a real gem. My friend and I took the train from Shinjuku Station to Shinagawa Station and then switched to the monorail to Haneda airport. On the way we caught a glimpse of Mt. Fuji’s snow covered peak, emerging from a pre-dawn greyness into the first light of the morning. The total travel time was under one hour. The flight to Ube airport was about 90 minutes and then we took the bus to Shin-Yamaguchi and a final bus to the former castle town of Hagi. We went there for three reasons. and many will want to soak up the history and stories of that time period. For example, on the nearby island of Ganryu-jima, between Honshu and Kyushu, is the venue where the historic dual took place in 1612 between the legendary swordsmen Myamoto Musashi and Sasaki Kojiro. The ruins of Hagi Castle are only a short bicycle ride away, as are the Tokoji and Daishoin Temples where members of the Mori clan are buried. The traditional, simple yet powerful architectural lines of the temples, complete with fields of lanterns and the tranquility of Zen gardens, offer a serene place to wander, learn and reflect. This too follows a theme for travellers to Japan, and emphasizes ‘silence’, ‘meditation’, ‘religion’ ‘temple architecture’ and ‘gardens’. Back to our Ryokan after a very fulfilling day we soaked in the hot bath, donned a yukata (kimono) and flip flops (provided for each guest) and then made our way to the dining room where we sat cross legged at a table about 2 ½ feet off the ground and savoured the flavour of delicious sashimi, rice, grilled fish, steamed vegetables and miso soup, along with Sapporo beer. A Japanese businessman at the table next to us heard me speaking English and invited himself to our table. He bought a round of beer and in a hilarious, somewhat inebriated state, engaged me in teaching him about Toronto and Canada. One of those memorable encounters. are the only ones on the planet appreciating this cave right now”. In the park, aside from the cave, there many walking trails on the plateau, so the visit was an adventure both above and beneath the ground. After returning to Yamaguchi City, we spent the following day exploring the Rurikoji Temple with its five-storied pagoda, the Joeiji Zen Temple and garden, and the modern Xavier Memorial Church, dedicated to the visit of St Francis Xavier to the city in 1551. After an equally delectable breakfast the next morning, we headed out to Akiyoshidai National Park. As we approached the park the landscape turned from an almost scrub brush appearance to karst (limestone) outcroppings and spires, and we also passed fields that showed the results of yama-yaki—the tradition of setting fires to re-energize the soil and stimulate crop growth. Yamaguchi prefecture is one of those off–thebeaten-track destinations for most North American tourists who tend to favour the TokyoKyoto corridor when they visit Japan. But sometimes getting off the track is the best way to learn and understand a country. The ‘Entrance to the Mountain Forest’ provides insight into Japan’s history, traditions, natural attractions, crafts and small towns. The Tokyo SKyTree is currently the tallest tower in the world at 634 Meters. While the tower appears in the customized colour of “SKYTREE White” during the day, in the evening the colours alternate between “Iki”, a pale blue light representing the Sumida River, and “Miyabi” (shown here) where the colour “Edo Purple” showcases the structure of the SkyTree. Take the Toei-Asakusa Subway Line to the Oshiage Station and then take in the scenery—including Mount Fuji—from the 450 m observation level. After an amazing lunch (for two) at Benkei Kaiten Sushi Restaurant in Niigata City, the cashier adds up the different colour plates, each indicating the price of the selected dish.